The Conference Videos are Now Available! 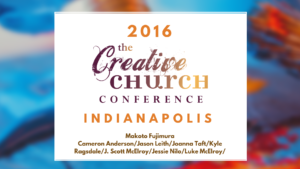 The Indianapolis conference ran June 3-5, 2016. We presented 8 main sessions, including panel discussions, and 14 workshops. Attedees interacted with creative leaders like internationally renowned artist and author Makoto Fujimura, Director of Arts at Saddleback Church, Jason Leith, CIVA Director Cameron Anderson, J. Scott McElroy, author of Creative Church Handbook and Director of New Renaissance Arts Movement, Jessie Nilo, Director of VineArts Boise, artist and curator Kyle Ragsdale, Executive Director of The Harrison Center for the Arts, Joanna Taft, and many more. See the speakers page HERE. See the schedule HERE. We featured some exciting things, like a First Friday field trip to the Harrison Center for the Arts.